The Stockholm Blockchain Forum will be opened by Ivan Liljeqvist, Co-Founder at Stochkolm Blockchain and world famous YouTuber under the channel Ivan on Tech. 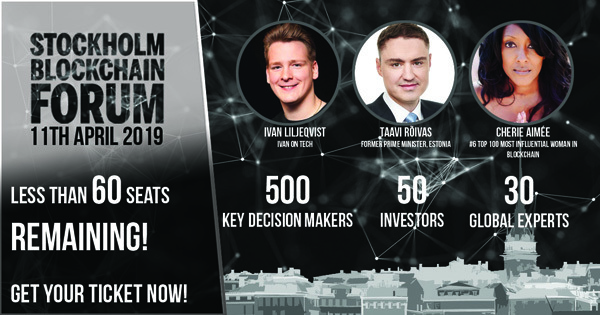 The speaker line-up also includes prominent names such as Taavi Rõivas, former Prime Minister of Estonia; Cherie Aimée, ranked as the sixth most influential woman in blockchain across the globe; Jimmy Zhao, Co-Founder and CMO at ZBX exchange; Christian Ander, the Founder of BTCX and the initiator of the Swedish Riksbank digital currency project E-krona; Henrik Hjelte, Co-Founder at ChromaWay which is collaborating with the Swedish government to put property ownership registries on a blockchain; Vahid Toosi, Co-Founder of EOS SW/EDEN; Mikael Wintzell, Co-Founder and CEO at Wellstreet; Shahjahan Yousuff Khan, CEO at Tokenine; Toni Nijm, CSO at CPA Global; Dr Guenther Dobrauz, Partner and Leader at PwC Legal Switzerland; as well as Frank Schuil at Safello, Sebastian Markowsky at GP Bullhound, On Yavin at Cointelligence, and Raoul Stubbe at Single Technologies among others. The conference is sharing its expo floor with four other conferences and exhibitors can benefit from hundreds of key decision makers under one roof. There are less than 60 seats remaining. The Stockholm Blockchain Forum is a must-go for anyone who wish to dive deeper into the actual use cases of blockchain and network with C-Suite professionals as well as some of the most innovative start-ups in the field. Previous Entry Durov is Afraid of Being Late with Gram?